Crowley's Mansion was a Magickal Occult Horcrux. 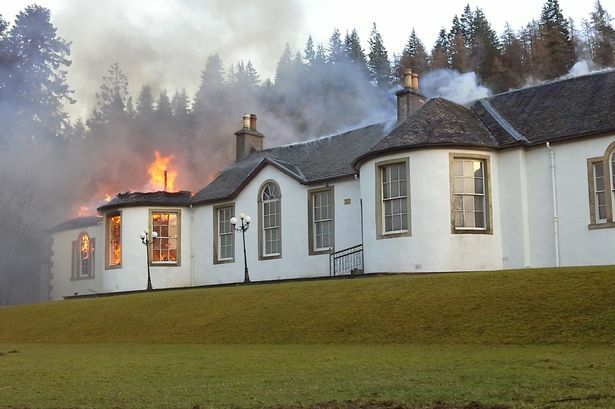 Instinctively I am convinced that there is a connection between the destruction of Crowley's Boleskine house and the subsequent apparent MASS DIE OFF of rock stars around the the world. The connection between the OTO, Aleister Crowley and various rock musicians such as David Bowie and Jimmy Page is fairly well known. It can hardly be a coincidence that one of Crowley's most famous fans: David Bowie, died less than three weeks later. Sounds weird...... but then the world's weird. Annie de Reuver (Anna Maria Clasina de Reuver)- Died 1-1-2016 - After and an operation on her hip ( Pop - Big Band ) Born 2-19-1917 in The Nederland - Singer - (She did, "Kijk eens in de poppetjes van mijn ogen" and "Hands Across The Table") - Worked with The Blue Blowers, The Ramblers and Coleman Hawkins. Mark B (Mark Barnes) - Died 1-1-2016 ( Hip Hop ) Born 1970 - Producer and DJ - Worked with Task Force and Blade. Michel Delpech (Jean-Michel Delpech) - Died 1-2-2016 in Puteaux, France ( Pop ) Born 1-26-1946 in Courbevoie, Hauts-de-Seine, France - Singer - (He did, "Wight Is Wight" and "Pour Un Flirt"). Gig Michaels - Died 1-3-2016 in North Carolina , U.S. - Pneumonia ( Rock ) Born 1-4-19?? - Singer - Was a member of Swamp Da Wamp(They did, "That Easy" and "Two Wheels"). Jason Mackenroth - Died 1-3-2016 in Nevada, U.S. - Prostate cancer ( Rock ) He was 46 years old - Saxophonist, singer, guitarist and drummer - Worked with The Rollins Band (They did, "Too Much Rock And Roll" and "Nowhere To Go But Inside"), Mack (They did, "Turn Around" and "Passing Thru"), The Lovemakers, Meat Loaf, Mother Superior and The Blue Man Group. Paul Bley (Hyman Paul Bley) - Died 1-3-2016 ( Jazz ) Born 11-10-1932 in Montreal, Quebec, Canada - Pianist - Worked with Charlie Parker, Lester Young, Charles Mingus, The Jimmy Giuffre 3, Sonny Rollins, Coleman Hawkins, Annette Peacock, Don Cherry, Pat Metheny, Jaco Pastorius and Ben Webster. Isaac Yeboah - Died 1-3-2016 - Car accident - Managed Amakye Dede. Robert Stigwood - Died 1-4-2016 - Born 4-16-1934 in Adelaide, South Australia, Australia - Entertainment entrepreneur - Managed Cream and The Bee Gees - Founded The Robert Stigwood Organization (RSO). Long John Hunter (John Thurman Hunter Jr.) - Died 1-4-2016 in Phoenix, Arizona, U.S. ( Blues ) Born 7-13-1931 in Ringgold, Louisiana, U.S. - Guitarist and singer - (He did, "El Paso Rock" and "Alligators Around My Door"). Achim Mentzel - Died 1-4-2016 in Cottbus, Brandenburg, Germany - Born 7-15-1946 - Guitarist, singer and TV presenter - Hosted TV's, Achims Hitparade - Was a member of Fritzens Dampferband - Worked with The Monokel Blues Band. Georgette Twain Sieff - Queen of the Banjo - Died 1-4-2016 in Reno, Nevada, U.S. - Born 6-10-1925 in Martinez, CA, U.S. - Sang and played banjo - Worked with her daughter fiddler, Cecilia Yale - National Four String Banjo Hall Of Fame Inductee. Pierre Boulez - Died 1-5-2016 ( Classical - Electronic ) Born 3-26-1925 in Montbrison, Loire, France - Conductor, writer and pianist - Worked with Frank Zappa on the album, "Boulez Conducts Zappa: The Perfect Stranger". Nick Caldwell (Nicholas Caldwell) - Died 1-5-2016 - Cancer ( R&B ) He was 71 years old - Singer - Was a member of The Whispers (They did, "And The Beat Goes On" and "Rock Steady") - Vocal Group Hall Of Fame Inductee. Pachy Carrasco - Died 1-5-2016 in Santo Domingo - He was 47 years old - Guitarist - Was a member of Bossa Pop. Elizabeth Swados (aka Liz) - Died 1-5-2016 - Complications following surgery for esophageal cancer ( Experimental ) Born 2-5-1951 in Buffalo, New York, U.S. - Composer and director for the musicals, "Runaways" and "Doonesbury" - Composed music for the films, "Four Friends" and "Seize The Day". Alfredo Armenteros (aka Chocolate) (Teodolo Alfredo Armenteros) - Died 1-6-2016 in Mohegan Lake, New York, U.S. - Complications of prostate cancer - Born 4-4-1928 in Santa Clara, Las Villas, Cuba - Trumpeter - Worked with Nat King Cole, Tito Puente, Arsenio Rodríguez, Generoso Jiménez, Chico O'Farrill, Wynton Marsalis, Orchestra Harlow, Eddie Palmieri, Johnny Pacheco, Cachao and Mongo Santamaria. Amy Regan - Died 1-6-2016 ( Folk - Pop ) She was 30 years old - Born in Morristown, NJ, U.S. - Singer and guitarist - (She did, "Getting Undressed" and "Haven't Changed Yet"). Kitty Kallen (Katherine Kalinsky or Katie Kallen) - Died 1-7-2016 in Cuernavaca, Mexico ( Pop - Swing ) Born 5-25-1921 in Philadelphia, Pennsylvania, U.S. - Singer - (She did, "Little Things Mean A Lot" and "Chapel In The Moonlight") - Worked with Jack Teagarden, Harry James ("I'm Beginning To See The Light" and "It's Been A Long, Long Time") and Jimmy Dorsey ("Besame Mucho") - Hit Parade Hall Of Fame Inductee. Troy Shondell (Gary Wayne Schelton) - Died 1-7-2016 in Picayune, Mississippi, U.S. - Complications of Alzheimer's and Parkinson's disease ( Rock ) Born 5-14-1939 in Fort Wayne, Indiana, U.S. - Singer - (He did, "This Time (We're Really Breaking Up)" and "Kissin' At The Drive-In"). Jit Samaroo (Jit Sukha Samaroo) - Died 1-7-2016 ( Calypso ) Born 2-24-1950 in Surrey, Trinidad - Played steelpan and bass - Worked with The Lever Brothers Canboulay Steelband and The Samaroo Jets - Was an arranger for The Charlotte Street band and The Amoco Renegades. Otis Clay - Died 1-8-2016 in Chicago, Illinois, U.S. - Heart attack ( Soul - R&B - Gospel ) Born 2-11-1942 in Waxhaw, Bolivar County, Mississippi, U.S. - Singer - (He did, "When The Gates Swing Open" and "Trying To Live My Life Without You") - Worked with The Voices Of Hope, The Christian Travelers, The Golden Jubilaires, The Famous Blue Jay Singers, The Holy Wonders, The Pilgrim Harmonizers and The Gospel Songbirds - Blues Hall Of Fame Inductee. Red Simpson (Joseph Simpson) - Died 1-8-2016 in Bakerfield, California, U.S. ( Country ) Born 3-6-1934 in Higley, Arizona, U.S. - Singer and pianist - (He did, "I'm A Truck" and "The Flying Saucer Man And The Truck Driver") - Worked with Lorraine Walden ("Truck Driver Man And Wife") and Junior Brown ("Semi Crazy" and "Nitro Express"). Jeff Martell - Died 1-8-2016 in West Springfield - Car accident ( Folk ) Born 8-4-1965 in in Pittsfield - Sang and played guitar and harmonica (He did, "I Got A Guitar" and "Crossroads"). Brett Smiley - Died 1-8-2016 in New York, NY, U.S. ( Glam ) Born 9-25-1955 - Singer - (He did, "Va Va Va Voom" and "Space Ace"). John Berry (John Kenneth Berry) - Died 1-9-2016 ( Rock ) Born 1964 - Guitarist and drummer - Was a member of Idaho - Son of actor, Ken Berry and actress, Jackie Joseph. Janis Vaisla - Died 1-9-2016 - Cardiac amyloidosis ( Pop ) He was 46 years old - Musician - Was a member of Pirates Of The Sea (They did, "Wolves Of The Sea" and "Happy Balalaika"). Cielito del Mundo - Died 1-9-2016 in Phoenix, Arizona, U.S. - Stroke and brain tumor ( Pop ) Born 1935 or 1936 - Singer, actress, politician and television host - (She did, "Your Tender Touch"). Bud Rehak - Died 1-10-2016 - (Co-writer of Diane Renay's, "Navy Blue" and "Kiss Me Sailor"). Hernan Gamboa - Died 1-10-2016 ( Venezuelan Folk ) Born 6-18-1946 - Singer and musician - Was a member of Serenata Guayanesa. Jack Penland - Died 1-10-2016 - House fire ( Bluegrass ) He was 79 years old - Singer and guitarist - Was a member of The Stoney Creek Boys and Uptown Grass. David Bowie (David Robert Jones) - Died 1-10-2016 in Manhattan, New York, NY, US - Liver cancer ( Rock - Glam - Pop ) Born 1-8-1947 in Brixton, London, England - Sang and played guitar, keyboards, harmonica, viola, cello, drums and saxophone - (He did, "Rebel Rebel" and "Changes") - Was a member of Davie Jones And The King Bees ("Liza Jane") and The Manish Boys ("I Pity The Fool"), The Lower Third ("You've Got A Habit Of Leaving"), The Buzz ("Do Anything You Say"), The Riot Squad and Tin Machine - Worked with Lou Reed, Brian Eno, Iggy Pop, Bing Crosby ("Peace On Earth/Little Drummer Boy"), Queen ("Under Pressure"), Mick Jagger ("Dancing In The Street"), The Pet Shop Boys ("Hallo Spaceboy"), Arcade Fire, David Gilmour, Marianne Faithfull ("I Got You Babe") and Mott The Hoople - Rock and Roll Hall Of Fame Inductee. Hoyt Scoggins (Rev. Hoyt Scoggins) - Died 1-13-2016 ( Rockabilly - Gospel ) Born 1-9-1926 in LaFayette, GA. U.S. - Singer - (He did, "Trudy" and "What's Gonna Happen To This Old World") - Led The Saturday Night Jamboree Boys (They did, "Tennessee Rock") -Rockabilly Hall Of Fame Inductee. Gary Loizzo (Gary Alexander Loizzo) - Died 1-16-2016 - Pancreatic cancer ( Rock ) Born 8-16-1945 - Singer. guitarist and engineer - Was a member of The American Breed (They did, "Bend Me, Shape Me" and "Step Out Of Your Mind") - As an engineer he worked with Styx, Bad Company, REO Speedwagon, Survivor, Slash and Liza Minnelli. Blowfly (Clarence Reid) (Clarence Henry Reid) - Died 1-17-2016 - Liver cancer ( R&B - Rap - Rock ) Born 2-14-1939 in Cochran, Georgia, U.S. - Singer - (He did, "I'm Gonna Tear You A New Heart" and "I'm Gonna Do Something Good To You") - Wrote for and/or produced Sam & Dave, Betty Wright, Jimmy "Bo" Horne, Gwen McCrae, KC & The Sunshine Band and Bobby Byrd - He has been sampled by Beyonce, Wu Tang Clan, Eazy-E, Big Daddy Kane and Mary J. Blige. Dale Griffin (aka Buffin) (Terence Dale Griffin) - Died 1-17-2016 - Alzheimer’s disease ( Rock ) Born 10-24-1948 in Ross-on-Wye, England - Drummer - Was a member of The Silence, The Charles Kingsley Creation, The Yemen, The Shakedown Sound, Silence, Mott The Hoople (They did, "All The Young Dudes" and "All The Way From Memphis"), The British Lions and Mott - Worked with Mick Ralphs and The Doc Thomas Group - Produced Hanoi Rocks and The Cult. Glenn Frey (Glenn Lewis Frey) - Died 1-17-2016 in New York, NY, U.S. - Complications of rheumatoid arthritis, acute ulcerative colitis and pneumonia ( Rock ) Born 11-6-1948 in Detroit, Michigan, US - Sang and played guitar, keyboards, harmonic and bass - (He did, "The Heat Is On" and "Smuggler's Blues") - Was a member of The Subterraneans, The Four Of Us, The Mushrooms, The Heavy Metal Kids, Longbranch Pennywhistle and The Eagles (They did, "Heartache Tonight" and "Hotel California") - Worked with Bob Seger and Linda Ronstadt - Rock And Roll Hall Of Fame Inductee. Mic Gillette - Died 1-17-2016 - Heart attack ( R&B ) Born 5-7-1951 - Played trumpet and trombone - (He did, "Before I Go" and "I Don't Want Nobody To Give Me Nothing (Open Up The Door, I'll Get It Myself)") - Was a member of The Opposite Six, Tower of Power, Cold Blood, and The Sons Of Champlin (They did, "Sing Me a Rainbow" and "Fat City") - Worked with Santana, The Rolling Stones, Sheryl Crow, The Doobie Brothers, Quincy Jones, Rod Stewart, Elton John, Jefferson Starship, Blood, Sweat & Tears and Huey Lewis And The News - Son of trombonist, Ray Gillette. Lee Abramson - Died 1-20-2016 in Lansing, Michigan - Born 9-13-1970 in Lansing, Michigan, U.S. - Musician - (He did, "Give Me A Glass" and "The Agony and Ecstasy") - First person to write music using ModelTalker a computerized speech production program - Worked with Violet Wine and Punchy - Ran for President of the United States as an independent in 2012. Alec Wishart - Died 1-22-2016 - Lung cancer - He was 76 years old - Singer and percussionist - Was a member of The Hogsnort Rupert's Original Flagon Band (They did, "Pretty Girl" and "All Our Own Work") which became Hogsnort Rupert. Cadalack Ron (Robert Paulson) - King Of The Mid Tier - Died 1-23-2016 ( Rap ) He was 34 years old - (He did, "Walk In" and "Burnt"). Jimmy Bain (James Stewart Bain) - Died 1-24-2016 - Possibly pneumonia ( Rock ) Born 12-19-1947 in Newtonmore, Highland, Scotland - Bassist, keyboardist and singer - Worked with Street Noise, Harlot, Rainbow, John Cale, Wild Horses (They did, "Face Down" and "Criminal Tendencies"), "Dio ("Rainbow In The Dark" and "Holy Diver"), Phil Lynott, Roger Chapman, The Scorpions, Roy Harper, Gary Moore, World War III, The Hollywood All Starz, 3 Legged Dogg, Kate Bush and Last In Line. Paul Kantner (Paul Lorin Kantner) - Died 1-28-2016 in San Francisco, California, U.S. - Multiple organ failure and septic shock after a heart attack ( Rock ) Born 2-17-1941 in San Francisco, California, U.S. - Sang and played guitar, harmonica and banjo - Was a member of Jefferson Airplane (They did, "White Rabbit" and "Somebody To Love"), Jefferson Starship and The KBC Band - Rock And Roll Hall Of Fame Inductee.